Rosewood / Boxwood Chess Set Pieces Galaxy Staunton 3" (76 mm) with 15" Rosewood Board + 2 Extra Queens, 4 Extra Knights & 2 Extra Pawns. 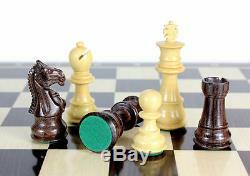 Rosewood / Boxwood Chess Set Pieces Galaxy Staunton 3" (76 mm) with 15" Rosewood Board. 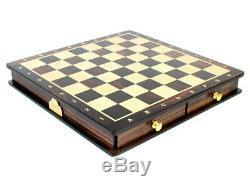 15" x 15" Rosewood Chess board with inlaid Algebraic notations. Square size - 1.65 (42mm). Beautiful Chess Board with matching 3 Rosewood / Boxwood Galaxy Staunton chess pieces. Chess pieces placed in foam cut outs inside the drawers. All drawers are having magnetic locks which hold the drawers tightly and don't let them fall. 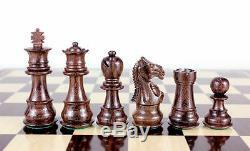 Beautiful Rosewood chess pieces with beveled bases. All chess pieces are triple weighted. Total weight of the chess pieces is 1.433 lbs (650 grams). King height - 3" (76 mm) Base - 1.1" (28 mm). 2 extra Queens + 4 extra Derby Knights + 2 extra pawns provided. Galaxy Staunton high quality hand crafted Knights by master craftsmen. All chess pieces have felted bottom. 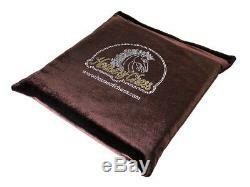 Velvet Cover with Logo for Chess Board/Box. Exclusive Chess Set in Rosewood with 4 Front Drawers. The chess set comes with additional 2 extra queens, 4 extra Derby knights and 2 extra pawns. 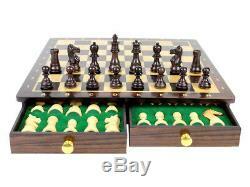 The chess set has board on top and comes with front 4 Pull drawers which are equipped with EP Foam chessmen inserts. All drawers are having magnetic locks which hold the drawers tightly and don't let these fall. Every Chess piece fits into the special Insert which has been made according to the shape of the chess pieces. The Insert is made of EP Foam specially meant for protection of pieces. Galaxy Staunton Chess Pieces are hand carved in the combination of Rosewood/Boxwood with beveled bases. All the chess pieces are triple weighted. 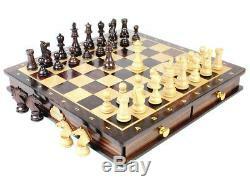 The King Height is 3 (76mm) and complete weight of chess pieces is 1.675 lbs (760 grams) 2 Extra Queens in the combination of Rosewood/Boxwood are provided with above chess set. These are stored in individual space along with other chess pieces inside tray box. 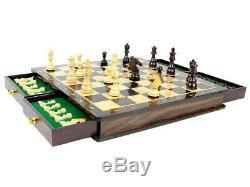 4 Extra Derby Style Knights are provided free of cost with above chess set. All these extra Knights differ in design and model from regular knights. Now, you have the option to play with any combination of knights either regular or extra. 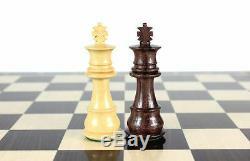 2 Extra Pawns are provided with above chess set. Inlaid Algebraic Notations The Chess board has algebraic notations on the borders which are inlaid in white maple. We do not use screen paint or colors, these numbers and alphabets are carved from natural maple wood and then inlaid. Velvet Cover with Logo Specially designed velvet cover with House of Chess Logo is being provided for the protection of chess board/box. 15" x 15" (38cm x 38cm). 13" x 13" (33cm x 33cm). Total Weight of Chess Pieces. 1.433 lbs (650 grams). 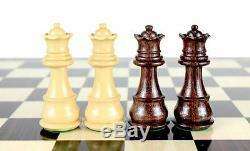 The item "Wooden Chess Set Pieces Rose wood Galaxy Staunton King Size 3 with Board / Box" is in sale since Tuesday, December 16, 2014. This item is in the category "Toys & Hobbies\Games\Chess\Contemporary Chess". The seller is "houseofchess_store" and is located in AMRITSAR, PUNJAB. This item can be shipped worldwide.